The last month has been busy with mostly good things – a wonderful week long visit with my son and his family in Virginia, welcoming a new colleague at work, winter finally giving up the ghost and the yard work that comes with it. I was feeling guilty because I don’t have a single thing planted in the garden. Hell, I haven’t even prepared the soil! I haven’t executed an honest to goodness cleaning binge in a good three months, the mail’s piled up and I still have a basement full of my parents’ things to go through and organize. I haven’t made a card since around Easter, and sewing patterns and skeins of gossamer butter-colored yarn, nascent visions of adorable heirlooms for baby Naya (yes, baby Blossom has a name!) taunt me every time I walk into my craft/ sewing/dressing room. So what do I do? Well invite the girls over for a direct sales party, of course! “The Girls” are a crazy quilt of women – some I’ve known for almost 30 years, others only a couple of years. They are farm wives, business women, mothers of school age kids, grandmothers I met at work/kids’ activities/church/neighborhood. We’ve shared office war experiences, parenting angst, mountaintop experiences on mission trips and more tears, laughter, cups of coffee and glasses of wine than I can count. The common denominator is that I cherish them all. A cookware/jewelry/makeup/home decor/craft party is just the excuse you need sometimes to do nothing but enjoy each other’s company and engage in a little retail therapy – and the guys are sure to hightail it out of the house for a while too. Honestly, it was also a chance to brag on my husband a little bit and show off all the work he’s done around here lately, the kitchen wainscotting, woodwork and refurbished cabinets and the beautiful floors throughout, even some of our furniture. Oh, and did I mention that girlfriends make the BEST guinea pigs when you want to try out some interesting sounding recipes you’ve found on Pinterest? So what does one serve at a grown up ladies’ ” tea party”? 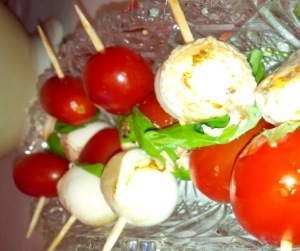 Caprese Salad Stacks: Skewer bite size mozzarella balls, fresh basil leaves and grape tomato on a toothpick, sprinkle with sea salt, coarse ground black pepper and drizzle with balsamic vinegar. Classic summer freshness. Prosciutto-Wrapped Stuffed Dates: Cut large pitted dates in half (but not all the way through), stuff with a chunk of Gorgonzola, Feta or other strong cheese. I used herbed goat cheese. Wrap with a strip of prosciutto. I placed them on a parchment paper lined cookie sheet and roasted in convection oven at 400 degrees for about 6 minutes. These were absolutely delicious! Salted Caramel Pretzel Brownies: Yes, I used a brownie mix. Don’t judge. Fudge-y, crunchy, gooey, salty nirvana. Drape your table in something unabashedly girly, put on the spa music, light a scented candle and serve up the lemonade in your prettiest pitcher, and you’ve got your self a party. Oh, and wine. Don’t forget the wine! For Pauline, Kathy, Amal, Judy, Donna, Marie, Jennifer, Abigail, Rekha, Cindy. 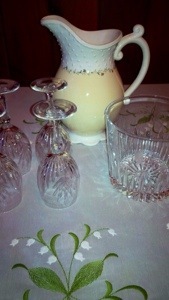 This entry was posted in Mad good recipes and kitchen creations and tagged appetizers, friends, home parties, recipes. Bookmark the permalink. Lovely snacks (tasty). Great group and fun conversation, not to mention the “bling”. Kevin is a very talented fella and married a real nice gal. Thanks for including me. What a way to spend a Sun. afternoon. It was fun. Kathy’s daughter, Amal, commented how cute all my friends were. We still know how to laugh! Your home is beautiful! Loved the stuffed dates. Abigail and I enjoyed the afternoon. I enjoyed having you! I was prepared with alternative activities for kids but she didn’t seem bored at all. I can hardly wait to see what she put together. Entering late here – but had a lot of fun and really enjoyed the eats.